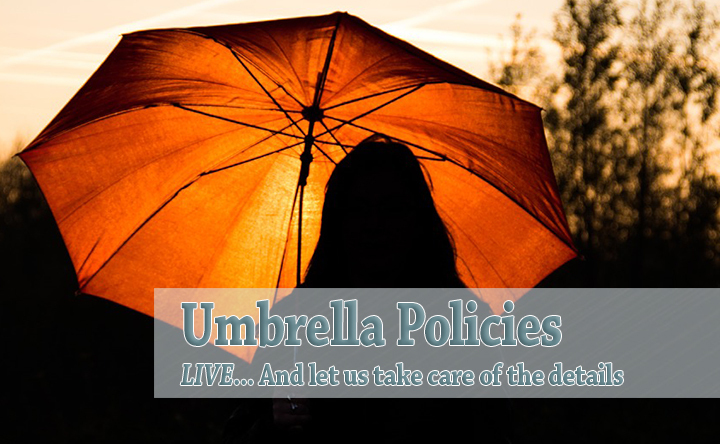 LIVE & let us take care of the details: Why an Umbrella Policy is important! - Scarsdale Premier Insurance Agency | Advocate Brokerage Corp.
LIVE & let us take care of the details: Why an Umbrella Policy is important! Think of Advocate Brokerage as more than your insurance broker (if you haven’t already), start to think of us as your trusted advisor who truly tries to understand your need, educate you on your risks and work on your behalf to ensure you are covered. Today we want to address Umbrella Insurance and why we at Advocate Brokerage think it might be the most important part of your insurance portfolio. It is the policy that allows you to relax and have peace of mind. We often refer to this as the “something has gone terribly wrong and we want you to be able to sleep at night” policy. A Personal Umbrella Insurance Policy is broad insurance protection that gives you extra liability above and beyond the limits of your other insurance policies (your homeowners, auto, or boat policy). That means that in the event of an accident, after your primary personal policy has paid out to the limit, your umbrella policy kicks in and will cover the additional liability up to the policy limit. ADVOCATE BROKERAGE TIP– It is imperative that you INFORM YOUR INSURANCE AGENT ABOUT THE ADDITION OF NEW DRIVERS, AS WELL AS ALL THE VEHICLES AND PROPERTIES THAT YOU OWN. You must keep your agent current, as the insurer must be made aware. In most cases this information is required to be listed individually on the policy. This is one of the reason we encourage you to insure everything with us…so the need to amend the Umbrella Policy does not fall through the cracks. An umbrella policy can keep you protected from lawsuits that come after an accident occurs on your property, while driving your car, even when you are at someone else’s home. The policy provides you with an attorney and pays legal fees regardless of the settlement. For high net worth individuals an umbrella policy can be especially important. In the event of a lawsuit, liability is the place where you can really be financially hurt. A loss of property is a finite number but when jury awards and settlements are involved, the sky really is the limit. Advocate Brokerage Tip – In many states someone who is partially responsible for an accident can be held fully responsible for damages under the laws of joint & several liability. For this reason, lawyers often name the party most able to pay as the responsible party rather than the party that is the most at fault. Your umbrella liability coverage should start where the limits on your homeowners and automotive insurance end. However, your umbrella policy requires that you carry specific underlying limits. Failing to do so can leave you with a gap in coverage and you would be responsible for paying the difference. If the liability limit on your homeowners policy is $100,000 and your umbrella policy requires a $500,000 underlying limit, you would be responsible for the $400,000 gap in coverage. Most of our umbrella policies pay for the legal defense cost without using up the liability limit and some include the cost of having a public relations firm protect your reputation.